The Onondaga Nation Trail Run was described by the winner of the 5K event as Old School Cross Country. The course was completely run in the woods of the Onondaga Nation land south of Syracuse, New York on a warm late November day after Thanksgiving. The paper birch and other trees on the hills were bare and allowed spectators to watch the runners climb them. 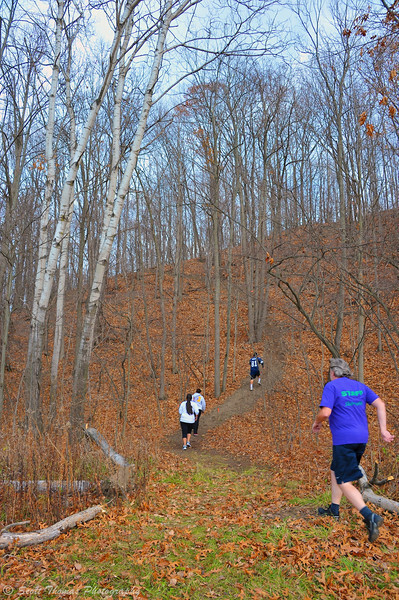 5K event runners climbing a hill during the Onondaga Nation Trail Run. Nikon D700/28-300VR, 1/125s, f/8, ISO 400, EV +0.3, 28mm focal length. This was the second year for this event which was attended by both young and old. There was a 1 mile Fun Run which did not include the hill above. For those runners who like a challenge, put this one on your calendar for 2013. This entry was posted in Sports, Weekly View and tagged 28-300mm, 5K, autumn, cross country, men, native american, new york, nikon D700, onondaga nation, paper birch, runners, running, syracuse, trail run, trees, vr, women, woods. Bookmark the permalink.